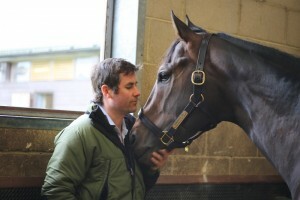 Robert Tincknell and Rebecca (Becky) Marsh started Trinity Park Stud in December 2011, on the site of a well established Thoroughbred Stud and home to English Derby winner ‘Slip Anchor’. Lord Howard de Walden who took over the estate in the late 1950’s, famous for his apricot silks, raised all his youngstock on this wonderful parkland of rolling paddocks, all purpose built to produce the finest of racehorses. Becky, who is responsible for the day –to- day running of the stud, lived her childhood in the heart of Somerset and from an early age showed a passion for horses. In her later school life Becky rode out for local trainers and obtained her arab racing jockey’s license to enable her to gain the experience of the racetrack. 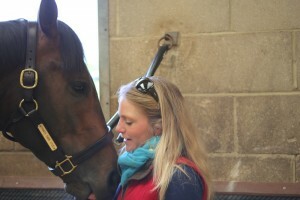 Her passion for Thoroughbreds, though, really set in during her studies at Hartpury College when during the summer months she would work for top sales consigner Ted Voute, preparing yearlings for all the major European sales. During her time with Ted she prepared many exciting prospects including the future Mozart and Milan. From that time on Becky’s career path was set in concrete. After graduating from Hartpury College in Equine Science, also gaining an additional college certificate in Stud and Breeding, her first full time job was at Fiona Marner’s Kingwood Stud where she learnt many aspects of the stud and breeding industry. Ambitious to broaden her horizons Becky then joined Eimear Mulhern’s Abbeville and Meadow Court Stud in Co Kildare, Ireland. The next 5 years saw Becky venturing to Kentucky, were she spent all her time at Indian Creek Farm working for Shackeford (Shack) Parrish Jr. Becky was quickly promoted to assistant farm manager, responsible for the daily running of the 1700 acre farm with over 250 horses and 50 members of staff this was the final path before returning to the UK to set up Trinity Park Stud.